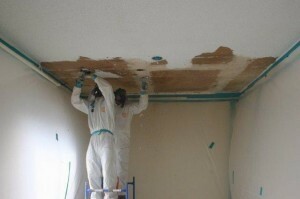 Popcorn ceiling removal in Alta Loma CA makes your property safer and more attractive. Even if you are reluctant to undertake a popcorn ceiling removal in Alta Loma CA for any other reason, this last reason should definitely make you reconsider. Asbestos-containing materials are safe as long as they are intact. But if they are damaged they will release asbestos fibers. If you inhale these fibers too often or in large quantities, they can get stuck in your lungs and potentially cause cancer. Because asbestos-containing ceiling materials release their dust into the air, they pose a greater hazard than materials that might leave dust on your floor. At AQHI Inc., we have considerable expertise in popcorn ceiling removal in Alta Loma CA and we can get the job done correctly and safely. We will get rid of all the “popcorn” without allowing dust to contaminate your property. We can do this because we always seal the work zone before touching the ceiling, we continually filter the air leaving the work zone, and we follow industry best practices for cleaning the room after work is complete. Many other asbestos removal contractors stick you with extra disposal fees once the job is underway and you really can’t do anything about it. This is not how we work at AQHI Inc. We include disposal of all waste generated by the popcorn ceiling removal in Alta Loma CA in our original bid. We are licensed to transport the waste to the disposal facility ourselves so our disposal fees are very reasonable. If you’re ready to get your popcorn ceiling removal in Alta Loma CA started, please call us at 800-481-8080 now. Our asbestos removal office for Popcorn Ceiling Removal in Alta Loma CA is open Monday through Friday between 8:00 AM and 5:00 PM and closed for lunch from noon to 1:00 PM. With advance notice, projects can be scheduled for weekends, early mornings and evenings.